HSBC is looking to carry out its next trade finance blockchain pilot in the Middle East, according to the bank’s regional head of trade. Speaking to GTR for its upcoming Fintech Issue, Sunil Veetil says the Middle East will be the next region of focus for HBSC when expanding its recently successful trial for a blockchain-based letter of credit solution. The bank made big headlines in May when it announced it had conducted its first live, commercial trade finance transaction on blockchain together with ING for agrifood trading giant Cargill. The deal was completed using the R3 Corda platform, with a cargo of soybeans exported from Argentina to Malaysia. Corda’s letter of credit module, which has been developed by 12 banks, enabled the transaction time to be reduced from a standard five to 10 days, to 24 hours. According to Veetil, the announcement created great interest among clients in the Middle East, some of which HSBC is now looking to involve in the next stage of the trial. He did not give any further information on which clients the bank is in discussions with, but says the Middle East is an “ideal place” for testing blockchain, given the region’s growing importance as a trade hub between the East and West. “If you look at the region, there is a huge reliance on trade, so there are huge benefits that our clients can derive from this technology,” he says. Another “uniqueness” of the Middle East, he explains, is that there’s considerable push for change from the regulators. “There is currently a large focus on blockchain, fintechs are opening up, banks are encouraging fintech and accelerators, and we have our own hubs where we work with locally groomed startups. Definitely I can see that interest is very high in the region, within the government and the regulators. And they are quite nimble, they move quickly,” he says. He adds that HSBC is currently in discussions with UAE regulators, which are keen to provide the necessary support for the bank’s blockchain pilot. The UAE has thrown its weight behind fintech and blockchain more so than any other government in the region. In April, it launched its Emirates Blockchain Strategy, which seeks to transform 50% of government transactions into the blockchain platform by 2021. In doing so it expects to save AED11bn in transactions and documents processed routinely, 398 million printed documents annually and 77 million work hours every year. Meanwhile, Dubai has its own blockchain strategy, run by its Smart City Office. Ideal for trade finance technology HSBC has also had a great focus on the Middle East for piloting other trade and supply chain finance technologies. Last year, when HSBC and IBM introduced an AI solution to automate and digitise trade finance documentation, they selected the UAE as one the first countries (together with Hong Kong) to go live in. The bank also recently rolled out its trade transaction tracker, a smart-phone based application, which was first piloted in Qatar. And it has just launched a new supply chain finance platform in the region together with Kyriba, a financial software provider. 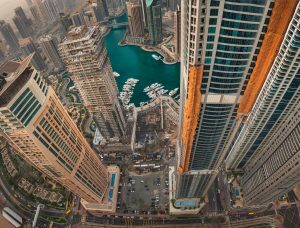 HSBC isn’t alone in its quest: a growing number of global banks and software firms are starting to see the Middle East as a perfect location to test and roll out new trade technology. Standard Chartered, for one, announced last week that it had chosen the UAE to kick off an “industry-first client pilot” for blockchain-based smart guarantees in trade finance, together with Siemens Financial Services and blockchain firm TradeIX. TradeIX’s CFO Daniel Cotti specifically quoted the government’s “enormous drive for digitalisation and blockchain” as one important reason for choosing that location over others. This was followed by an announcement by Finastra, one of the world’s largest financial software companies, that it had joined Bahrain’s accelerator programme Bahrain Fintech Bay, with the goal to expand its open innovation platform FusionFabric.cloud to local fintech startups. Finastra went live with the platform earlier in June in order to accelerate innovation for its 9,000 bank clients by allowing them to easily connect to fintech applications within an open marketplace. “Now couldn’t be a better time to be part of this community as the Bahrain Fintech scene heats up,” says Wissam Khoury, Finastra’s managing director for the Middle East and Africa. While it’s still early days for fintech in the Middle East (in fact, the region had as of January 2017 only attracted 1% of the US$50bn raised globally by fintech startups since 2010, according to consulting firm Accenture), it seems that this is set to change. Fintech Hive, an accelerator which was launched last year in Dubai International Finance Centre (DIFC), kicked off its 2018 programme this week, after having received “overwhelming response” from applicants for what will be its second programme. It got more than 300 applications from around the world – three times more than in 2017. According to Raja Al Mazrouei, executive vice-president of FinTech Hive at DIFC, it is a “testament to the increasing demand for disruptive technologies in the region”. As for HSBC, it has not revealed the specific timeline for the roll-out of its blockchain solution for letters of credit. Vivek Ramachandran, the bank’s global head of innovation and growth for commercial banking, told GTR in May that we can expect to see another few live transactions on the platform, as the bank learns how it interacts with the systems of other banks and corporations. Then the primary focus will be on driving industry-wide adoption. “We’ve still got a few more steps to do before we get to widespread adoption,” he said. The post HSBC exploring Middle East for next trade finance blockchain trial appeared first on Global Trade Review (GTR).